If corporate America woke up from a dream last year to face a new marketplace reality, then this year a bucket of ice water, in the form of diminished profits, was thrown in its collective face. Fortune 500 companies with publicly traded shares suffered a $4.1 trillion decline in market value during 2009.1 That decline of 37% was a landmark for the Fortune survey, which began in 1955. And another dismal record was set—a 43% loss in profits over a two-year period, $5.3 trillion from 2007 to 2009. These shocking numbers leave corporate leaders with a monumental task in re-climbing the profits ladder. And not since the Great Depression has the marketplace called for the kind of innovation, creativity, insight, pragmatism, and persistence from its leaders that it will now need. In this 2009 survey of Fortune 500 and Fortune 1000 corporations, 2 MCCA examines how minority general counsel fared in this unprecedented financial environment with its unique challenges and problems. Forty-three general counsel of color were at the legal helm of their companies in 2009, an increase of four from 2008. Companies with minority general counsel today account for 8.6 percent of the Fortune 500; they made up 7.8 percent of the group last year. In keeping with the 2009 overall trend, these companies maintained high revenues, even exceeding their numbers from last year. This year those companies earned $1.21 trillion in revenues, representing 11% of the 2009 performance of the Fortune 500 as a whole (a slight increase in share from the previous year). Of these 43 companies, 27 continue to rank among the Fortune 250. This year, 24 companies (the same figure as last year) had revenues between $5 and $20 billion, and 16 could claim revenues greater than $20 billion (one more than last year). This year, Exxon Mobil and Walmart Stores, Inc., traded places in the top two slots on the list. Despite the vagaries of the oil market, Exxon Mobil brought in an astonishing $45 billion in profits. The oil giant was followed by last year´s top company, Walmart, with $13.4 billion. Despite the retailer´s slide to second place, investors continue to be favored with recession busting high returns.3 This year, the top five companies by measure of profits were Exxon, Chevron, Microsoft, General Electric, and Walmart. Chevron´s legal department is headed by Charles James, an African American. Further down, at number 9 on Fortune´s most profitable list, Procter & Gamble also has a top African American lawyer, Steve Jemisen. 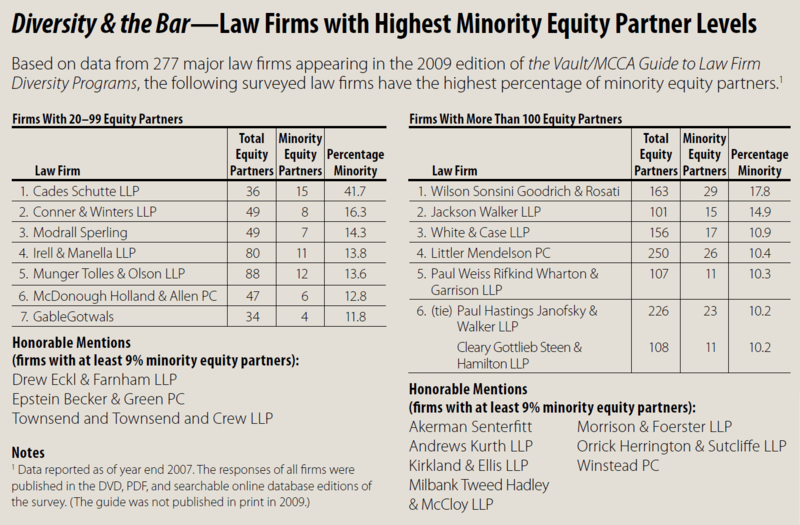 None of the minority counsel-led companies were present on Fortune´s “biggest losers” list. With regard to industry representation, this year´s group of companies with minority general counsel once again had only one petroleum company (Chevron). The group also included four additional companies in the energy sector (Exelon, PG&E Corp., Consolidated Edison, and Sempra Energy) and two in pipelines (Targa Resources and Spectra Energy). Food-based businesses made a particularly strong showing in 2009 (Pepsico, Publix Super Markets, McDonald´s, General Mills, Sara Lee, Starbucks, and Dole Food). Other industries represented include four in the insurance/finance sectors (MetLife, Allstate, Guardian Life Insurance Company of America, and KeyCorp) and five electronics/office equipment companies (Dell,Xerox, Synnex, Wesco International, and Broadcom). But the talents of minority counsel were used in a wide variety of business arenas, including engineering/construction, industrial/farm equipment, gas and electric utilities, and specialty retailers. Just as their talents are spread throughout industries, minority general counsel also find themselves in locations throughout the United States. California is home to nine minority general counsel-led companies, followed by New York with seven, Illinois with six, Ohio and Texas with four, and Pennsylvania with three. Washington state, Florida, Connecticut, Georgia,Nebraska, Minnesota, and Colorado are also represented in this year’s list. Four minority GCs departed from the 2009 Fortune 500 list, one fewer than in the previous year. Leaving the ranks of Fortune 500 general counsel and replaced by white males were Leonard J. Kennedy (Sprint Nextel), George W. Madison (TIAA-CREF), and Lisa Iglesias (Nordstrom). Wendy Shiba moved to the Fortune 1000 in 2009 as her company slipped from the Fortune 500. At press time, a successor had not yet been named for Ivan Fong, who resigned as GC of Cardinal Health to serve in the Obama administration as GC for the Department of Homeland Security. This year, MCCA´s survey finds five African Americans and one Hispanic appointed to general counsel positions at Fortune 500 companies during the past year (see the following section for more information on these attorneys). This year, 26 African Americans serve as general counsel in the Fortune 500, a slight increase in the number reported last year; 11 Asian Americans serve as general counsel, one fewer than in 2008; the number of Hispanic general counsel increased to 5; and the list once again includes one Native American general counsel. The MCCA survey of Fortune 500 general counsel of color reveals that women made no additional gains this year with their number remaining at eight. Thirty-five (81.4 percent) of the general counsel on the 2008 list are male, and only eight (18.6 percent) are female. The racial breakdown for men is 20 African Americans, 3 Hispanics, 10 Asian Americans, and one Native American. Of the eight minority women general counsel, five are African American, two are Hispanic, and one is Asian American. Andrea L. Zopp had been serving as senior vice president/ chief human resources officer at Exelon prior to her appointment as GC this year. She came to Exelon in 2006 with a strong corporate background that included working as general counsel at Sears Holding Corporation, a retail company formed by the merger of Sears Roebuck and Co. and Kmart. Zopp received her J.D. from Harvard Law School. Please see p. 25 to learn more about her. Elizabeth Moore rejoined Consolidated Edison as GC via an appointment from the CEO; she had embarked upon her legal career with the company as a staff attorney. Prior to accepting her current position, Moore was a partner at Nixon Peabody LLP, where she specialized in public finance, employment law, government compliance, and regulatory affairs. Moore also was co-chair of the firm’s Diversity Action Committee. Earlier in her career, Moore was counsel to New York governor Mario Cuomo, and during her career in state government, she also served as the Chair of New York State Ethics Commission. Moore received a J.D. from St. John´s University School of Law in 1978. Please see p. 25 of the July/August 2009 issue of Diversity & the Bar for more information about her. In June of 2009, Brett Hart was named the new general counsel of Sara Lee, where he has worked as assistant general counsel since 2003. Prior to Sara Lee, Hart was a partner at Sonnenschein Nath & Rosenthal in Chicago. Before that, he served as special assistant to the general counsel of the U.S. Department of the Treasury. Hart holds a J.D. degree from the University of Chicago Law School. Frank Jimenez became general counsel at ITT in June 2009. He previously served as general counsel of the Navy, where he led a global office of nearly 850 staff as chief legal and ethics officer. In this position,Jimenez was one of seven Senate-confirmed Pentagon civilians of four-star equivalent rank overseeing the U.S. Navy and Marine Corps. Earlier in his career, Jimenez served as chief of staff for the U.S. Department of Housing and Urban Development (HUD) under Secretary Mel Martinez. Prior to HUD, Jimenez was deputy chief of staff and acting general counsel for Florida governor Jeb Bush. Jimenez received his law degree from Yale Law School, and he holds a master`s degree in business administration from the University of Pennsylvania. Leslie J. Parrette Jr. became senior vice president, legal affairs, of WESCO International, Inc. in April 2009. Prior to joining that company, he served as GC, corporate secretary, and compliance officer of Novelis, Inc., an aluminum rolling and recycling company. Before that, he was senior vice president, GC, and corporate secretary of Aquila, Inc. (which since has divided into Black Hills Corporation and Great Plains Energy). Mr. Parrette also had served as a partner in the law firm of Husch Blackwell Sanders LLP from 1992 to 2000, where he specialized in mergers and acquisitions, privatizations, and equity transactions. He received his J.D. from Harvard Law School. The number of minority general counsel on the Fortune 1000 list fell by three from twenty-six in 2008 to twenty-three in 2009. Four companies that had minority general counsel in 2008 have dropped off the list, and three new companies have arrived. Ana Rodriguez (Molex) was replaced by a white male. In the case of Anatolio (A.B.) Cruz III, Scripps Networks Interactive, Inc., was established as a corporation separate from The E.W. Scripps Company following a spin-off in July 2008. Cruz is the executive vice president, chief legal officer, and corporate secretary of the new company, which does not appear on this year´s Fortune list. The three newcomers to the list include one Hispanic male and two Hispanic women: John Torres of Lennox International, Maria Pasquale of Celgene,and Lisa Washington of Atlas America. (For more about Pasquale, see p. 24 of the July/August issue of Diversity & the Bar). The 2008 Fortune 501-1000 group is composed of 10 African Americans, 5 Hispanics,7 Asian Americans, and one Pacific Islander. Last year´s survey had representation by eleven African Americans, ten Asian Americans, and five Hispanics. A breakdown by gender finds 17 minority males (75 percent) and 6 minority females (25 percent) servingas general counsel among Fortune 1000 companies. Of the men, seven are African American, three are Hispanic, six are Asian American, and one is a Pacific Islander. Of the women, three are African American, two are Hispanic, and one is Asian American. California is home to five companies with minority general counsel, claiming the largest share. The group, however, is spread more widely throughout the United States, including Hawaii and Puerto Rico, than those represented in the Fortune 500. As in previous years, general counsel of color work in a diverse range of industries, with gas and electric utilities and healthcare-based industries enjoying prominent presence on the list. 1 Allan Sloan, Market Myths, Fortune, May 4, 2009, 38, Fortune, May 4, 2009, 38. 2 In this article, the term “Fortune 1000” refers to companies ranked among Fortune’s 501-1000 companies. 4 The short-form biographies are derived in large part from corporate press releases and similar issuances; this material is on file with both the author and publisher. MCCA thanks freelance writer Rachel Ray for all of her work in the preparation of this article, analysis of the survey results, and related research; Vicki Richardson, Esq., for completing the extensive and time-consuming survey of 1,000 companies to compile data on race/ethnicity and gender of the general counsel; and Patrick Folliard for authoring the profiles of the minority general counsel featured in this article.